Patron-in-Chief, Victorian Governor, the Honourable Linda Dessau AC. With lives at stake, there’s no time to waste. The Alastair Lucas Prize for Medical Research allows the highest calibre researchers to immediately start life-saving work. Burnet Institute: Medical Research. Practical Action. EducationHonours ProgramPostgraduate StudyInternational StudentsCome and study at Burnet! Simple methods to detect liver disease at the point-of-care (POC) are urgently needed as part of the global effort to eliminate hepatitis C, and hepatitis B infection. A POC test developed by Burnet Institute spinoff company, Nanjing BioPoint Diagnostic Technology (Nanjing BioPoint) to detect liver disease was recognised as an example of ‘China Good Technology’ by the China Association of Productivity Promotion Centres (CAPPC) in 2017. Nanjing BioPoint completed the initial development in 2016 of a prototype POC test for alanine aminotransferase (ALT), an enzyme which can indicate liver disease or damage, to address this unmet need. Field studies on the use of the ALT test will start in late 2017, initially in patients infected with hepatitis C where it is important to determine the level of liver disease to guide appropriate antiviral therapy. Such POC tests are likely to prove useful for many other diseases, including the detection of non-alcoholic fatty liver disease, the monitoring of pre-eclampsia in pregnancy, and drug toxicity in tuberculosis therapy. IMAGE: The Nanjing BioPoint team (L-R) Dr Fan Li, Mr Aaron Zhu, Ms Sophie Wang, Ms Joyce Kong, Associate Professor David Anderson, Dr Feng Yi, Ms Maggie Zhang. 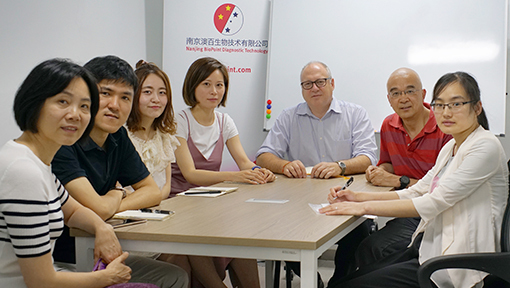 Burnet Institute Deputy Director and CEO of Nanjing BioPoint Diagnostics, Associate Professor David Anderson, said the urgent need for a point-of-care test for ALT was an important stimulus for Burnet’s establishment of Nanjing BioPoint in 2013. “This project has been the focus of our collaborative R&D since that time and includes laboratory teams and clinical collaborators in Melbourne and Nanjing, Jiangsu Province,” Associate Professor Anderson said. “This test posed very significant challenges during development, so we are excited to bring it to reality, combining Australian and Chinese expertise, and now supported with our own manufacturing capability established at Nanjing BioPoint. Associate Professor Anderson paid credit to the persistence of key R&D team members Mary Garcia, Huy Van and Zhimei (Maggie) Zhang, the wider BioPoint team including Dr Fan Li and Dr Feng Yi, Burnet Institute, and investment partners Beijing GuoMinXinHe Investment Fund Co. Ltd.,” he said. 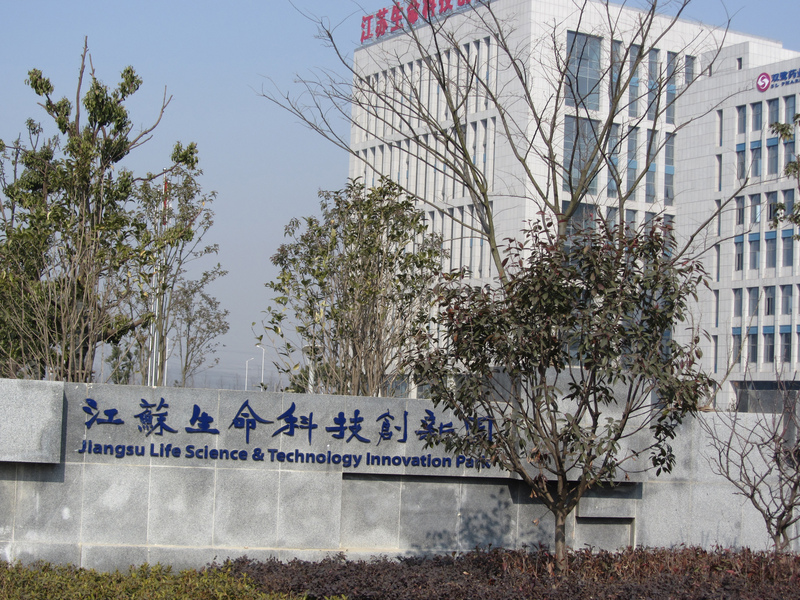 Burnet’s company, Nanjing BioPoint Diagnostic Technology Ltd is based here at the Jiangsu Life Sciences and Technology Innovation Park. Nanjing BioPoint Diagnostic Technology Co. Ltd. was established with a grant from the Nanjing Government and investment from Burnet and from Beijing-based investment firm, GuoMinXinHe. To achieve better health for vulnerable communities in Australia and internationally by accelerating the translation of research, discovery and evidence into sustainable health solutions. Receive updates and IMPACT magazine. This website was developed with the generous support of a donor. Burnet Institute (Australia) is located on the traditional land of the Boon Wurrung and Wurundjeri people and we offer our respects to the elders past and present. We recognise and respect the cultural heritage of this land.